It's just another day. It's just a number. Some people get all weird about getting older. I mean really, one day you are 43 and the next 44. Did anything change overnight? It's kind of like being 17 one day and then one day later you have a birthday and turn18. You can vote now because 24 hours haveI have passed. Are you any wiser than the day before and have clarity on our government system? Or one day you are 20 and then twenty-four hours later . . . BAM! 21. Can you handle your alcohol better than the day before? Will you make better decisions? It's just a number! I think if people really thought about what was giving them grief around their birthday, they would find it's not because they were turning a year older. It's because of a reflection or reflections. Or maybe even because of their foresight(s) of what might be in store for the future. So the fact that I am feeling a little bluesy about having an upcoming birthday isn't because I am going to be 44. It's because of the reflections I have been having. Or really reflection. I miss my dad. Birthdays are not the same without him. My life is not the same without him. And that will never change. No dramatization behind my words. Just the truth. Despite how I feel, I do know I have a pretty good run going on in my life. And I don't ever and will never take that for granted. I just want what I can't have. And so even with getting older & wiser, that part never changes. The perfect day with our guy! Seriously, THE BEST SCRATCH CHOCOLATE CAKE EVER! And the Marshmallow Fluff Buttercream frosting was to die for. This year we spent our break in Park City. We decided to get our last skiing in before the warmer weather made its' debut. This was also the first time I flew solo with the kids; David met us a few days later. An epic day to ski! We were so lucky to have 3 days of fresh snow! Is this not the coolest wall? Thanks for a great time Park City! Our first full winter was fabulous. See you soon for the next season! For the last 3 years, life without you has felt like this sign. No outlet. Not a through street. 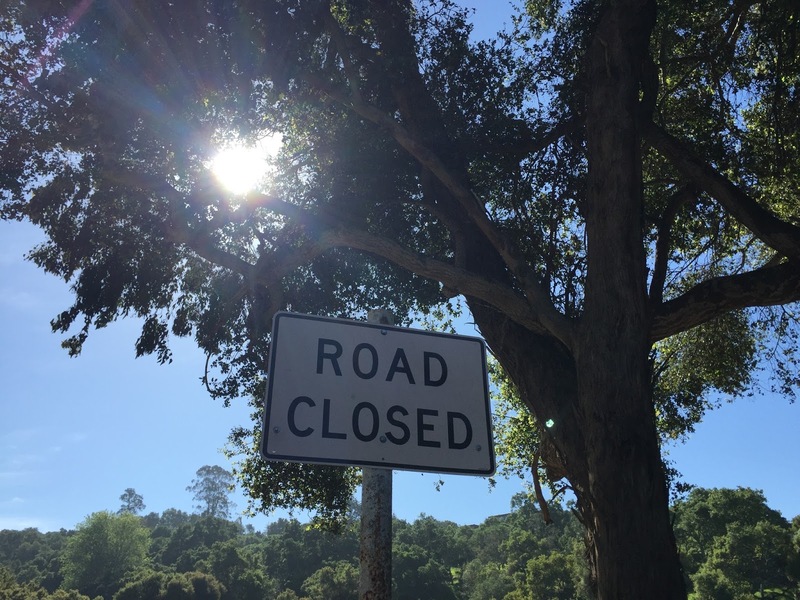 Our road to each other...closed. Although at times I feel lost without you, I am figuring out how to take the detours. Unlike detours drivers come across, I am not choosing to take the shortest way. I am choosing to take the quality way. The scenic route. "Are we there yet?" It's hard to slow down. Hard to go the speed limit. Even harder to go less than the limit. But it's been worth it! I am finally figuring that out. Yes, Miss Type A is taking her foot off the gas pedal. And you know what? It's been truly rewarding. Not sure how school feels about it, but I know I am giving the girls experiences and memories that far outweigh some missed days. The 'views'. The views along the way have been familiar yet different. Sometimes, they haven't been what I always thought...but sometimes people aren't, right? Then there are the views I took for granted. I am thankful for the chance to see the beauty I had missed the first few times around. The detours have been straight and windy. Sometimes simple, sometimes exciting, and sometimes complicated. And this is when you say, "Such is life." With every bend or fork in the road, there has been a lesson learned. The detours have been challenging and disappointing at times. Tears have been shed. Sleepless nights have ensued. And there's been lots of self-doubt. But it's all been strangely fulfilling. Our road is closed. An unforeseen road block made its' way into our lives. So now, without you, I detour. My heart would be so full to see you along my way. But there are several pitstops I still need to make. Someday I will see you at one of them. Just not yet.